Few more days and the big day of Dagan sa Kalilangan 2012 shall finally commence. And, the pride of running as far as 21km or the full marathon can only be materialized if we reach the finish line and earn the Finisher's medal. 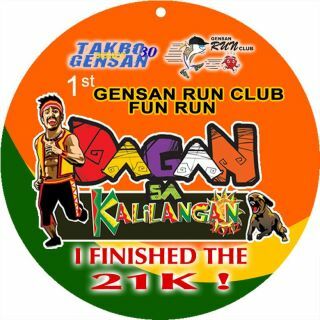 In as much, I love to run my first official 21km and earn this beautiful Dagan sa Kalilangan finisher's medal. So, if you haven't registered yet, please visit all GenSan Jollibee outlets, Kreativ Boutique - Gaisano Mall and GSCPO's office. You get to visit our website, GenSanRunClub.com, too for online registration.